In early December of 2009, MAPS 3 was approved by Oklahoma City voters. With a slate of projects that includes a new streetcar line, convention center, sidewalks and more, the taxpayer-funded plan will dramatically alter the city, just as the original MAPS did. Perhaps no project will be more visible than a 70-acre central park linking downtown to the Oklahoma River area. Below you'll find information on the upcoming Oklahoma City Downtown Park, some basic facts as well as a list of frequently asked questions. Location: Two sections connected by the SkyDance Bridge over I-40. The upper section will sit between Hudson and Robinson from the interstate up to the upcoming Oklahoma City Boulevard, and it will incorporate the historic Union Station building at SW 7th. The lower section stretches west to Walker on the northern portion and as far south as SW 15th. What will the park look like? : Back in 2012, the city asked residents what they wanted to see with the MAPS 3 park. After compiling survey results, designers at Hargreaves Associates released three conceptual concepts, and again the public was encouraged to comment. In 2013, a park master plan was unveiled. Though it all has yet to be finalized, the plan includes a large grand lawn on the northern side of the upper section and a large lake in the middle. Just north of the stage on the grand lawn is a cafe, and there are play areas between the lake and the lawn. On the lower portion, sports fields are included on both the north and south sections, and the middle contains wetland gardens and a dog run area. Here is a full presentation of the master plan. What other features will be included? : If all goes as planned, the park will satisfy just about any need. Walk through the woodlands or across the prairie, play soccer on the field, lounge in the shade, or enjoy the beauty of the gardens. And that's not nearly all. 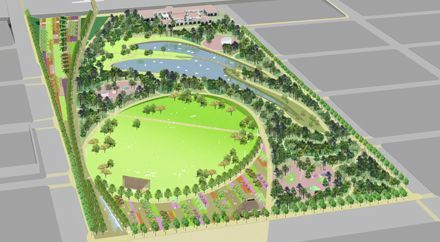 The lake will feature paddle boats, and the lawn is perfect for big outdoor events such as concerts or movie screenings, as designers say it will accommodate 20,000 people. Will the streetcar pass by the park? : Not directly, but if nothing changes, it won't be too far away. Right now, the recommended MAPS 3 streetcar route moves along Reno west to Hudson. So park visitors would only have to walk a block. And future expansion could take the streetcar even further south along Hudson. How will OKC pay for the park upkeep? : While construction costs are paid for through MAPS 3 sales tax collections, the city will have to fund park operation. Some of the costs can be covered through revenue at the cafe or large events, and designers have recommended the formation of a non-profit group to manage the park. But many details have not yet been decided. What about the buildings that are there now? : Well, as noted above, plans call for saving the Union Station building and incorporating it into the park, perhaps as park offices or an event facility. At this time, all other buildings are scheduled for demolition. However, some are attempting to save other historic structures such as the 90-year-old Film Exchange Building at SW 5th and Robinson. How long before the park is being constructed? : The timeline calls for completing the park in three phases. The first, which includes land acquisition and design, is already underway. You'll start seeing major evidence of construction during phase 2, probably around 2017, and the lower section will be the last piece of the puzzle.